I know there are plenty of people who have books all over the place. The floor, the coffee table, the sofa…just about everywhere. I wouldn’t consider myself one of these people. I have my two shelves right here that are a bit dusty, but nonetheless fairly organized. I’ve always wondered at how people organize their own shelves. Not really because I care, but because I can’t see myself organizing mine any differently. Before I tell you how I have my books organized, let’s talk about some ways you might organize yours. Fair enough. I think every bookstore I’ve ever been in has organized their books by author last name. The books are easy to find and you have all of the author’s books in close proximity to one another. For all of you diverse readers, this may be best suited for you. Maybe you read some romance and sci-fi and YA and mystery and you want them to be separate for when you go back and reread your books. I mean, bookstores are basically set up this way with the different aisles for different genres, so why not your personal collection? Can’t go wrong here. You have your books in alphabetical order based on the book’s title. Easy enough. Now let me tell you how mine are organized. Answer choice C. I have my books in alphabetical order based on the book’s title. I suppose I could just as easily have them listed by author last name, but I’ve never liked that. I know it works for others because I’ve seen their shelves, but eh I like my way. So that’s it. How do you organize your bookshelves? Do you use one of the three systems I mentioned or something else? Okay guys, this is the first poem I wanted to share with you all. I’d love to know what you think. Please! Okay guys, y’all know every so often I’ll write about topics that have nothing to do with books or writing. I do this because I don’t know about you, but there’s more to me than talking about books. It’s quite minimal, actually. I pretty much only talk about that stuff on here. Anyway, today’s post is about someone I’ve actually already written about on here before. And it’s her birthday today. Her name is Lilly, but her 4 million YouTube subscribers know her as Superwoman. I first wrote about her in July when I just happened upon one of her videos. Suffice it to say that I haven’t missed a single video or vlog of hers since. Here’s my letter. It’s your birthday and I imagine you have things to do and people to see to help celebrate this grand occasion. I’m hoping you’ll be able to take just a few minutes to read this. I have to be honest with you, I am a very late comer to Team Super. I’ve never previously been someone who would subscribe to YouTube channels or watch too many videos. Mostly YouTube was where I’d listen to music to decide if a particular song was worth downloading. The funny part is that I discovered your channel by doing just that. It was the first week of July and a random article appeared in my Facebook News Feed talking about a YouTube comedian and rapper and this generation. I honestly had no idea what it was talking about or why I even clicked it. But I did. I read the article and thought I might as well watch the video. I watched the video and could not stop singing #Leh for a good couple of weeks. I downloaded it and watched something like 50 of your videos over the next two days. You had me hooked. That’s my little story about how I discovered your channel. I subscribe to four channels and two of them are yours. But this post isn’t meant to tell you how hilarious I think you are or which of your videos is my favorite. I’d like to tell you why it is that I’ve come to enjoy what you do. So let me tell you. You say shemurr. You call your fans unicorns. I could go on and on, it’s all great. Truly. And of course all of that is part of the reason why I’m so entertained by you, but there’s so much more. Ask me to describe you in one word. I’d choose genuine. And I didn’t even have to think about it. Why? Because over the course of the last few years you’ve been so very open with your viewers. Are there things that we don’t know about you, I’m sure, but there’s something to be said about someone allowing millions of people in on their life. I couldn’t do it. And I know most people couldn’t, but you have. I mean, who hasn’t seen video or pictures of some celebrity walking around with an entourage 10 or 20 deep. It’s like they operate as a wall between them and the so-called “regular” people. But not you. You vlog everywhere and I’ve never seen you surround yourself with people or security or anything like that. I think this is part of the reason why your viewers are so enthusiastic. You’re approachable and you don’t cut them off. People ask for a hug and you give one. People ask you to sign something and you do so. People ask to take a picture and you never refuse. People cry and freak out upon meeting you because you’re a friend. Sure you’re a celebrity and it’d be impossible for you to get to know every one of your viewers, but I can sit here and honestly say there’s no doubt in my mind that we could meet and have a short conversation. That’s what makes you different from other people in the public eye. PS: that Harry Potter cake in one of your super early videos was INCREDIBLE! Second, I think this satisfies your request from your last video to tell people about your channel. Back to you WordPress reader, you can check out her channel here. I leave you with one of my favorite videos she’s done. Have a Favorite Writing Instrument? I have to be honest with you all, I have a list of post ideas on my phone and I picked this one because I figured it’d take the least amount of time for me to write. Most only take about 20 minutes or so, but I’m sleepy and I’m looking to cut that time in half. So let’s get on with it, shall we? How many writing instruments would you say we have available to us? I’m thinking maybe a handful? For the sake of this post I was going to focus on the physical act of writing, but we write on computers more than just about anything, right? So I think it’s only fair to include them in any discussion about writing instruments. So let’s see…pen. pencil. Laptop/desktop. Are there any more? I mean, I guess markers and crayons too. But the only writing done with either of those two is on the walls by the baby who thinks he’s helping decorate his room. Oh, a quill! Are there places you can actually buy ink and quills? I’m not sure about those. Anyway, those are the only writing instruments I can think of. I guess typewriters count too, especially since I can shamelessly link back to that post just because I mentioned them. Ha. Let’s see if I have a favorite. Pens. They’re easy to write with unless they have some kind of gel ink that smears as you write across. I have to admit that I have a couple dozen notebooks from college full of pages and pages of notes from various classes and probably like 95% of all of that was with pencil. I’m not sure how come I did that. Maybe I made a lot of mistakes in the course of note taking and I didn’t want to have my pages full of things scratched out? It was always mechanical pencils with the nice erasers too. On another note, I had a lot of gel pens in elementary school? Wait, is that weird? Uh oh. Oh well. So what’s your favorite writing instrument? Maybe it’s one I didn’t mention? Anyone who has followed my blog for as little as a few weeks knows that I’ll pretty much write about anything pertaining to books. You could enter any number of keywords into the little search bar to the right and I’m certain that multiple posts will come up for any of the main keywords you can think of. With that being said, there is something I’ve adamantly left off the blog during my 15 or so months on WordPress. Can you guess what it is? I think my die hards just may be able to. I’ve never published my own writing on here and even wrote a post about why I’ve chosen to do this. Welllll I’ve been doing a little thinking and I may change my position. But now you might wondering what I’ll even post since most of you are well aware of the fact that I’m not actively working on my WIP. I’ve said this many times in prior posts. So what will I even post on here? I’m glad you asked. You see, a type of writing that I thoroughly enjoy reading is poetry. I’ll never claim to be a poet or to have any idea what the heck I’m doing when it comes writing poems, but I’ve written a few poems this year that I thought were okay. Now I’m thinking I may write a few more to share with you all. What do ya think? I mean, it’s worth a try. This is not me being one of those people who thinks anyone can write poetry. Trust me, I don’t think that at all. You can think of this more as me testing out the waters of something so very foreign to me. I don’t have a set schedule for when I might post poems I’ve written, nor do I know when I’ll have my first for you all. But you’ll see when I do and all I ask is that you be respectful. Cause I’m perfectly fine writing my rants on everything books, but posting my own writing on here is a little scary. A little. Okay, not really. So tell me what you think of this idea. Tell me now. I’m pretty sure I’ve written about every logical book related question you can think of. 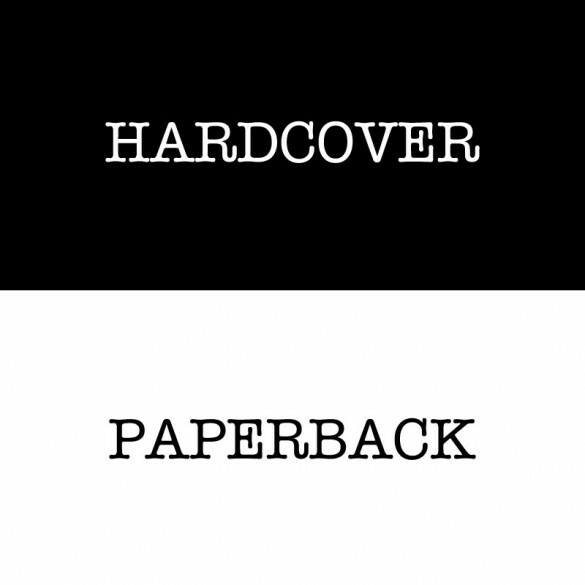 Print v. e-books. Standalone novels v. series. Types of e-readers. Different genres. And a million others I honestly can’t think of right now because I’ve written way too many posts to remember each one. I’ve had this question on my little docket for some time now. I don’t know if I was saving it for any particular day or what, but it’s been waiting to be written and now I guess it’s happening. So, hardcover v. paperback. I think I typically list out some of the positives of each choice whenever I write these comparison posts, so might as well get to it. I have to be honest here. I’m not seeing a long list of positives for hardcovers. They’re way overpriced it’s not even funny. I mean, I love books as much or more than the next person but I am not okay with spending $29.95 for a book. No. Thankfully, Amazon and other retailers often slash the price of hardcovers immediately. But if they’re not new or bestsellers, then you better pull out your wallet. I don’t even pay that much for Blu-rays. Hm. Let’s see. They’re also bulky. They can potentially be used as weapons in the event of nothing better. They take up a lot of room on the shelf. And I can’t be the only one who hates those stupid dust jacket covers that always want to slide off while I’m trying to read. So annoying. Oh wait, I was supposed to list the positives here. Okay. If you’re lucky enough to meet an author, they much prefer to sign hardcovers over paperbacks. I don’t know why, maybe larger pages? Now this may be a bit more positive. Let’s see. They’re typically less than half the price of the hardcover edition. Don’t forget it is the exact same book. They’re much easier to carry around if you’re into that sort of thing (I take my books to my bed and nowhere else.) They’re easier to store on your shelf. In my opinion, they’re more pleasing to admire on said shelf. Easier to hold while reading. And I have more paperbacks signed by authors than hardcovers. So there. The only real negative is that they’re often released almost a year after the hardcover. Stupid publishers. For the sake of this post I tallied up my books so I could provide some concrete evidence about what I think of this little question here. I have 175 books. 41 hardcovers. 134 paperbacks. Hm sorry Big Five. Not really. So tell me which side of the fence you fall on. I’m obviously having trouble seeing any reason to have shelves full of hardcovers, maybe you’ll offer some insight. I think Banned Books Week actually began yesterday, but I was too busy writing about candlelight to remember that I wanted to write a post about it. Whoops. So, it’s officially Banned Books Week 2014. Don’t you think this week should be a bit more celebrated than it is? I mean, I would be willing to put a whole lot of money on the fact that no one in my family even knows about it. I wish someone would give me that opportunity so I could become an instant millionaire. But no, no one has asked me to bet any money. It’s an unfortunate occurrence. But now you get to hear about it from me. Each year the American Library Association releases its annual list of most challenged books. These challenges are not astronomical numbers, but they do happen and come from religious groups, parents, and sometimes even teachers. Don’t be misled by the name of the annual list or by the name of the week itself. These books aren’t banned, just challenged. Well I guess technically some books are actually banned in other parts of the world where banned books is a real thing, but that has nothing to do with what I’m writing here. So the ALA releases its list relatively early in the year and then celebrates Banned Books Week a little later on. Now I know what you’re wondering. How can you celebrate? Simple, read a book from the list. Or two. Or the top ten. Here’s a refresher of the current list of the most banned books. So there you have the top ten. And if you’re in a celebratory mood and feel like reading one of the books listed, then I’d suggest tackling #5. But that’s just me. Also, if you’re interested in my thoughts about each book on the list, check out this post from earlier this year in which I discuss each book.